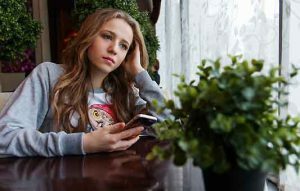 Girls are twice as likely to show signs of depressive symptoms linked to social media use, mainly due to online harassment and disturbed sleep, as well as poor body image and lower self-esteem, compared to boys at age 14, according to new UCL research. The paper analysed data from nearly 11,000 young people from the Millennium Cohort Study. The participants completed information on their social media use, online harassment, sleep patterns, self-esteem and body image – all of which are potential pathways to having depressive symptoms. The questionnaire has 13 questions and asks young people about whether, in the previous two weeks, they have felt miserable, cried a lot thought they could not be as good as others, found it hard to think properly or concentrate (for example). The researchers found that 14-year-old girls were heavier users of social media with two fifths of them using it for more than three hours per day compared with one fifth of boys. Only 4% of girls reported not using social media compared to 10% of boys. The findings also showed that 12% of light social media users and 38% of heavy social media users (five or more hours a day) showed signs of having more severe (clinically relevant) depression. “The link between social media use and depressive symptoms was stronger for girls compared with boys. When the researchers examined the underlying processes that might be linked with social media use and depression they found 40% of girls and 25% of boys had experience of online harassment or cyberbullying and 40% of girls compared to 28% of boys said their sleep was often disrupted. When it came to body image, self-esteem and appearance – while more girls were affected, the gap with boys was not as great. Researchers found the most important routes from social media use to depressive symptoms were shown to be via poor sleep and online harassment. Social media use was proportionately related to less sleep, taking more time to fall asleep and more disruptions during sleep. In turn, depressive symptom scores were higher for girls and boys experiencing poor sleep. Time spent on social media was related to involvement with online harassment which had direct and indirect associations (via sleep, poor body image and self-esteem) with depressive symptom scores. The pathways from social media to depressive symptoms were the same for girls and boys.